Ontario Community Newspaper Association Awards - Premier Awards - Special section, circulation 10,000+ - 1st place for Wellington Advertiser's "Celebrating 50 Years"
"Very nice section! A great community keepsake. Loves the focus on each department of the paper. Very well presented. Congratulations!" Canadian Community Newspaper Awards - Premier Awards - circulation 10,000+ - 2nd place, Best Holiday Edition for the Wellington Advertiser's "Canada 150"
"The editorial pages feature a selection of opinion-based commentary and letters to the editor. 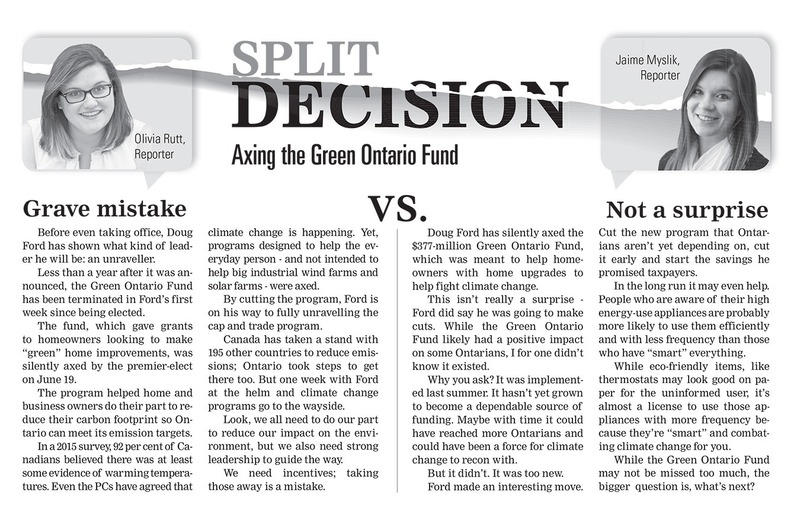 I enjoyed the Split Decision feature that pits two sides of an issue against each other. It was enjoyable to have both sides of an argument presented next to each other." Ontario Community Newspaper Association Awards - Premier Awards - Special section, circulation 10,000+ - 2nd place for Wellington Advertiser's "Canada 150"
"The Wellington Advertiser had all the right elements to make a great newspaper." "Nice, creative set up. Not your easy going and lazy grip-and-grin. Great job Olivia Rutt."